For decades, we were told that dietary fat was terrible for us. We responded by reducing our intake, and the food industry responded by replacing fat in packaged foods with sugar. Turns out, we had it backwards all this time, and the reason is shocking. 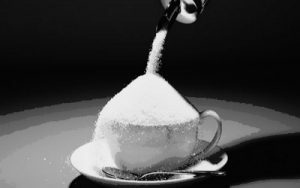 In the 1950s, studies showing a link between coronary heart disease (CHD) and sugar intake started to emerge. When the sugar industry (which many not-so-affectionately call “Big Sugar”) got wind of this not-so-sweet news, they paid scientists to downplay the link and promote saturated fat as the culprit instead, a new study has revealed. The research, published in JAMA Internal Medicine, was based on thousands of pages of Sugar Research Foundation (SRF) documents, reports, and statements that Cristin E. Kearns, a postdoctoral fellow at UCSF, discovered in the basement at Harvard University. The SRF (known today as The Sugar Association) sponsored its first CHD “research project” in 1965 – a literature review published in the New England Journal of Medicine. The review’s objective was established by SRF, and the group contributed articles for inclusion and received drafts. The SRF’s funding and role was not disclosed. The studies used in the two-part review – which was published in the respected New England Journal of Medicine in 1967 – were handpicked by the sugar group. Naturally, the group chose studies that minimized the link between sugar and heart health and made saturated fat appear to be the dietary bad guy. Building on recent analyses of other related documents, the UCSF discovery provides evidence that the industry also sponsored a research program in the 1960s and 1970s that successfully cast doubt about the hazards of sugar while promoting fat as the dietary culprit in CHD. In the 1950s, rates of CHD-related deaths in American men led to studies on the role of diet in the development of the disease. In 1957, John Yudkin British physiologist and professor of nutrition, identified added sugars as the main problem, while American scientist Ancel Keys (whose studies had serious flaws) claimed total fat, saturated fat, and dietary cholesterol were responsible. As early as 1967, Yudkin suggested that the excessive consumption of sugar might result in a disturbance in the secretion of insulin, and that this in turn might contribute to atherosclerosis and diabetes. Yudkin’s warning that it was not dietary fat, but sugar, that was a major contributor of the development of conditions such as obesity, diabetes, and heart disease was criticized and ridiculed by the food industry and other researchers – including Keys. Keys was influential, and he aggressively pushed his “diet-heart hypothesis.” Even though some studies did not support the theory, and and there was no actual proof of a link between dietary fat and cardiovascular disease, the ideology picked up speed. Big Sugar was very aware of Yudkin’s research, and knew he was a threat to the industry: SRF’s vice president and director of research, John Hickson, was paying close attention. After the NEJM review, the sugar industry continued to fund “research” on CHD and other diseases in order to protect its product’s reputation. In 1971, it influenced the National Institute of Dental Research’s National Caries Program to shift its emphasis to dental caries interventions other than restricting sucrose. It commissioned a review called “Sugar in the Diet of Man,” which it credited with – among other industry tactics – favorably influencing the 1976 US Food and Drug Administration (FDA) evaluation of the safety of sugar. By the 1980s, few scientists believed that added sugars played a significant role in CHD. When the first 1980 Dietary Guidelines for Americans was released, it focused on reducing total fat, saturated fat, and dietary cholesterol for CHD prevention. Unfortunately, Big Food maintains a friendly, mutually beneficial relationship with “scientists” and groups that are supposed to provide unbiased health information to the public. Last year, Coca-Cola tried to tell us that their products aren’t making us fat – we’re just lazy! The sugary junk-beverage company paid some big-name nutrition science and weight loss experts to downplay the link between soft drinks and obesity. Not only has Coca-Cola paid nutritionists to promote Coke as “heart-healthy”, between 2010 and 2015, the company spent $132.8 million on funding for “scientific research” and payments to health and fitness experts who mentioned its drinks in blog posts or columns. Coca-Cola even created a pseudo-research group called Global Energy Balance Network (GEBN) and posted two “research papers” on their website that “show” the key to preventing weight gain is not reducing food intake, but exercising more. Both papers were funded by none other than…Coca-Cola. GEBN shut down last December after months of pressure from public health authorities who said the group’s mission was to downplay the link between soft drinks and obesity. In early 2015, the Academy of Nutrition and Dietetics (AND), a trade group that represents 75,000 registered dietitians and other nutrition professionals, launched a new Kids Eat Right label. The first product to have the honor of wearing that label was…Kraft Singles. The label gave the impression that it was a seal of approval of some sort, but in reality, Kraft PAID the academy an undisclosed amount to use it on its pseudo-cheese product. …financial ties between AND and Big Food go way back. In 2013, food industry lawyer and researcher Michele Simon documented their mutually beneficial relationship in her report titled And Now a Word From Our Sponsors: Are America’s Nutrition Professionals in the Pocket of Big Food? Companies like PepsiCo, Kellogg, and ConAgra regularly attend AND’s meetings, where they make presentations to dietitians, hold seminars and parties, and provide free samples of their products. Back in July, a study that proclaimed that eating pasta does not cause obesity and is linked to lower BMI turned out to not only be seriously flawed for reasons discussed here, but also was partially funded by Barilla – a company that makes pasta. Big Sugar is a large, powerful, and wealthy industry that has been using Big Tobacco-style tactics to influence policy and ensure that government agencies dismiss troubling health claims against their product for decades, and there is no end in sight. Related: Surprise: Big Food Industry’s Paid Experts Say Processed Foods Are Great!